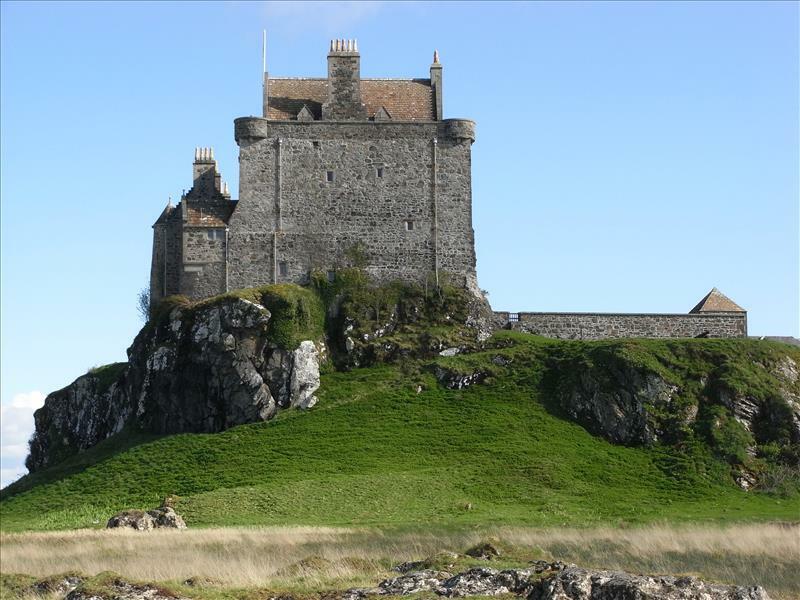 Duart Castle (Caisteal Dhudhairt), the ancestral home of the Clan Maclean, is one of the most imposing castles on the west coast of Scotland. It stands on a commanding site lying at the intersection of three major waterways: the Sound of Mull, Loch Linnhe and the Firth of Lorn. From Duart it is possible to observe vessels passing through Loch Etive, while the neighbouring castles of Dunstaffnage, Dunollie, Achadun and Ardtornish are all clearly visible. Duart Castle was visited by the Ordnance Survey on 17th May, 1972. The notes below are edited from the subsequent visit report, which is now in the archive of Royal Commission on Ancient and Historical Monuments in Scotland (RCAHMS) in Edinburgh. 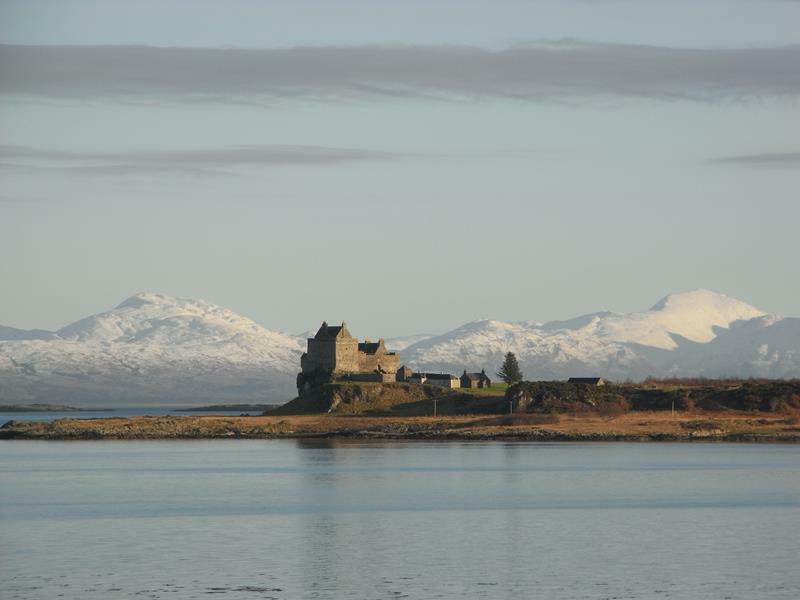 Duart Castle seems originally to have consisted of a rectangular defensive wall enclosing a courtyard measuring 19.7 m from north west to south east by 21.5 m transversely. The entrance was in the south-west curtain-wall, and one or more sides of the courtyard were probably occupied by stone or timber, lean-to buildings. There are no clear indications of date, but the structure appears to belong to a class of stronghold well represented on the western seaboard and attributable to the 13th century. The north-west extremity of the rock, which is somewhat lower than the remainder of the summit area, lay outside the main defensive wall and may have enclosed to a small ancilliary court containing a kitchen and other offices, together with the castle well, which is all that now survives. Towards the end of the 14th century, following its acquisition by the MacLeans, the castle was enlarged, any existing buildings on the north-west portion of the rock were cleared and a substantial tower-house was erected. This has very solid walls, those on the outer sides being heavily buttressed, while the inner (south-east) wall was built directly against the outer face of the 13th-century curtain-wall. The tower had a ground-floor cellar and three upper storeys, the first floor being occupied by a hall. No doubt the erection of the tower-house enabled much of the accommodation provided by the original courtyard-buildings to be abandoned or re-allocated, but the first major alteration evident in this part of the castle appears to have taken place about the middle of the 16th century, when the present south-east range was constructed. This had two main storeys, including vaulted cellars, a first-floor hall and, perhaps, a part-garret. At the same time a gatehouse was added to the original entrance-gateway in the south-west curtain-wall to strengthen it, and the south-east section of the adjacent curtain and the south angle were rebuilt. The upper-works of the tower-house were probably remodelled at this time too, and the postern-doorway at the north corner of the castle seems to have gone out of use. Accordingly, part of the rock platform directly outside the postern was enclosed to form a small apartment at ground-floor level, possibly a prison, with a gun-platform above. 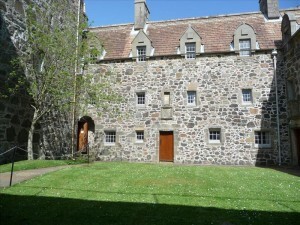 Towards the end of the 16th century, the north-east range of courtyard buildings appears to have been remodelled and equipped with a projecting stair-turret at the rear. 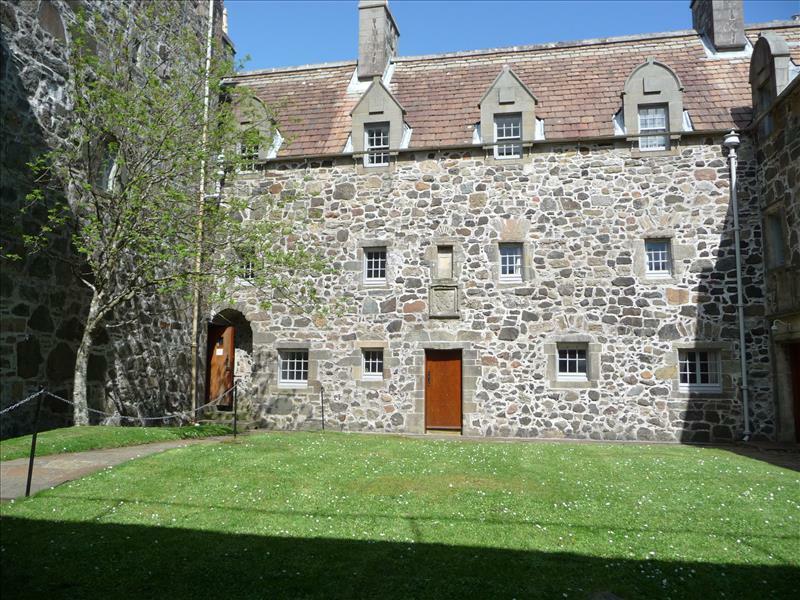 By the middle of the 17th century the north-east courtyard-range seems to have been abandoned and perhaps dismantled, but in 1673 it was reconstructed to form a three-storeyed building. Following the acquisition of the castle by the Campbell Earls of Argyll in 1674 a number of repairs were carried out, but, although the building continued to be garrisoned from time to time’, it does not appear to have been lived in on a regular basis. The fabric soon deteriorated, and by 1748 the tower-house was roofless and derelict, while the roofs of the remaining buildings were no longer weatherproof. The MacLeans re-acquired the castle in 1911, by which time it was completely ruinous, and restored and partially reconstructed it during the following year. Royal Commission on the Ancient and Historical Monuments of Scotland, 1980, visited June 1972.